Lead is a poisonous heavy metal, which is nice. Therefore we treat it with respect, all old lead is carefully removed and bagged this then is taken to a licensed recycle centre where it will be sent for remanufacture. This is then passed to the lead mills rolled to a fine finish for us to buy and put back on your roof, don't worry we wont have to wait, in Blue Peter style we will invariably turn up with some we had made for us earlier. This new lead will be in different weights i.e. 3lb, 4lb, 5lb. but as we are now metric these are called Codes 3,4,5. Note the colour. If some Johnny tells you that he is using code 5 and you see green tape on the roll - Sack Him. So why or what are the different grades used for? Well Code 3, is thin and will sit under slate i.e. between two slates and they will then lay right and not be proud. 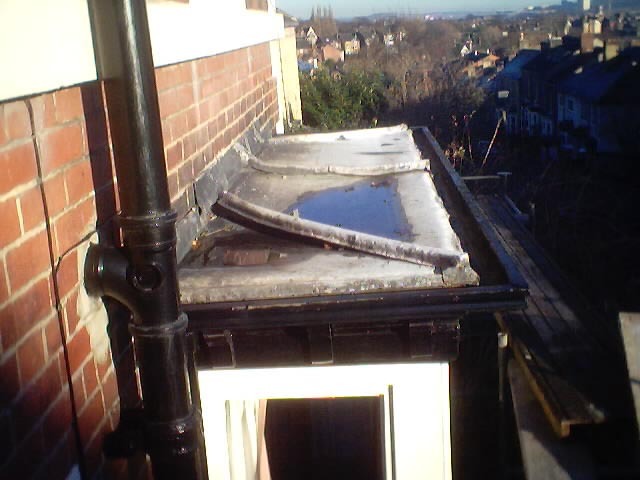 Usually used as a soaker for sealing the roof to an abutment such as a chimney or a wall see picture. 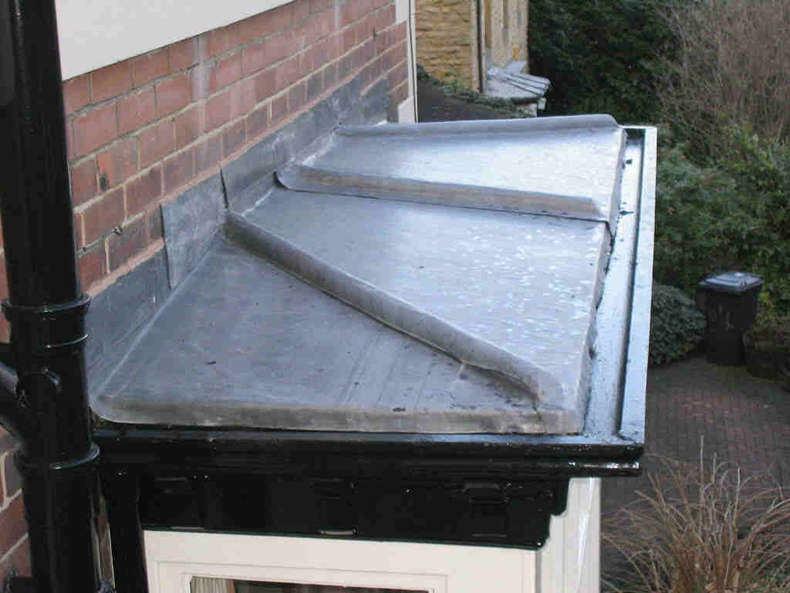 Code 4 is for flashings and valleys, bay tops etc although at Dean-Roofing we tend to use Code5, Why ? Well thicker is better even if dearer. If you want a cheap job your on the wrong site. See below how we tackle a bay top. (the pictures are links to a larger version, use you back button to return). The Problem. A sunk lead covered bay. to gain a better view. 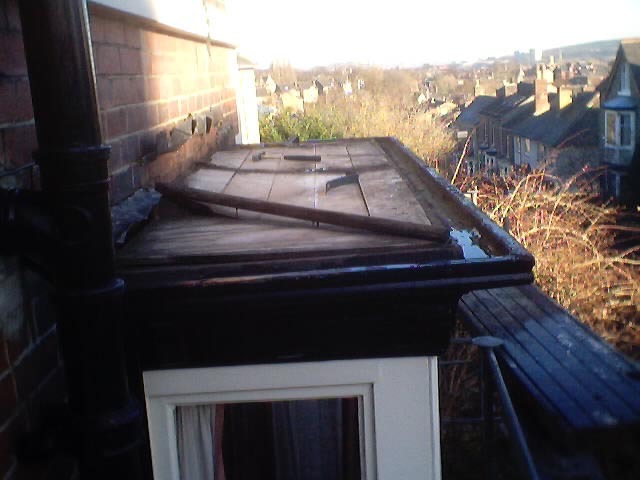 .Here we can see the remedial work on its way to completion ready for the substrate to be fixed. All new wood is screwed to reduce the risk of damage to the old plastered ceiling. 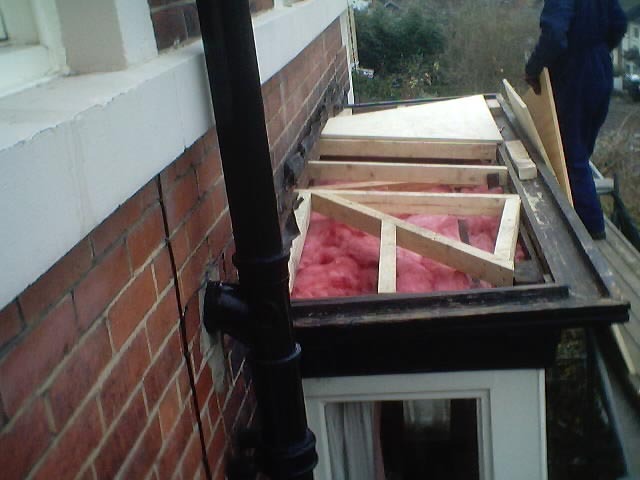 The wood cover is plywood 18mm thick which is then covered in sheet lead. The Lead we use is Milled Lead code 5, that is one square foot weighs 5Lbs.